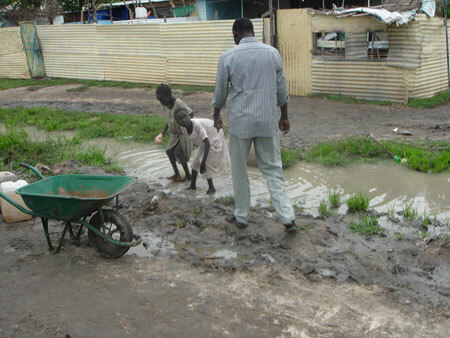 Children playing in wet season puddles near to the World Food Programme headquarters. The man is telling them not to play in dirty water. Morton, Chris. "Malakal wet season" Southern Sudan Project (in development). 03 Jan. 2006. Pitt Rivers Museum. <http://southernsudan.prm.ox.ac.uk/details/2007.137.79/>.